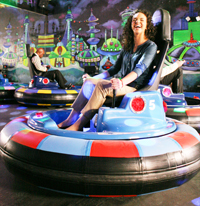 All the fun of bumper cars, now with 360 degree drivability and wild spins! 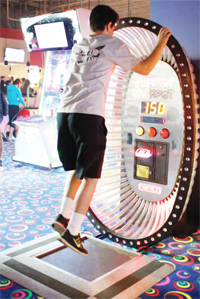 Come get your game on with over 100 of the latest arcade games. 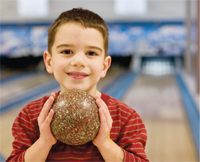 Enjoy our mini bowling lanes without the hassle heavy balls and shared shoes. Perfect for the entire family. An exciting course to test your endurance and climbing ability! 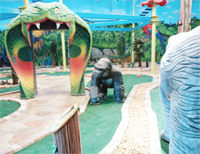 Experience the jungle at our challenging mini golf experience. 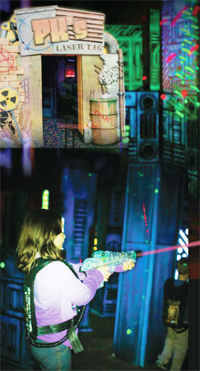 Heart-pounding laser tag excitement with all your friends! 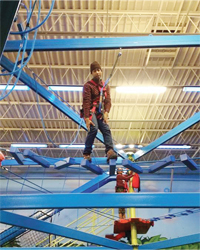 A fun, harnessed rope climbing adventure course in a safe and controlled environment 20 feet above the ground! Great food and fun! Enjoy our full menu of delicious food and our full bar with a wide range of beers and spirits for your enjoyment. World-class birthday parties are one of our many specialties. Company Events and parties improve morale and help to reduce stress, while creating important bonding tools that are put to work immediately in the workplace. Your personal facilitator will help you energize and maximize your team building experience. PK’s Play Zone and Grille is a high-excitement family fun center. 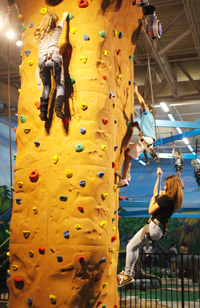 Come visit us in our fun and friendly atmosphere where the whole family will have something to do and enjoy. Give us a call so we can help you customize your next party or event.